Oort cloud revealed: 2012 VP113 has largest perihelion distance known. Artist’s depiction of a distant Kuiper Belt object, the Sun, and inner solar system far, far away. Click to encometenate. 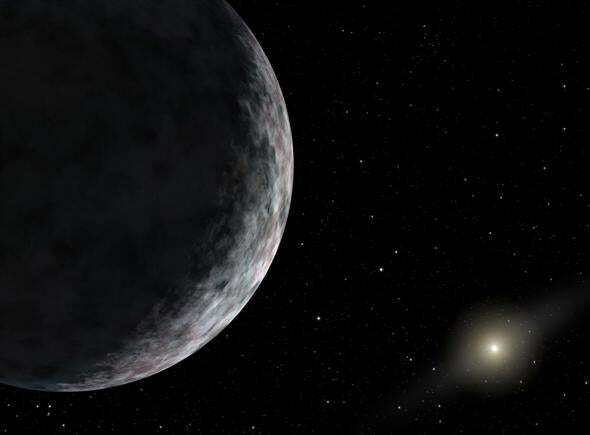 Astronomers have announced the discovery of an amazing object in our solar system: 2012 VP113, an icy body with an orbit so big it never gets closer than 12 billion kilometers (7.4 billion miles) from the Sun! That’s 80 times the distance of the Earth from the Sun. No other solar system object known stays so far from the Sun. And at its most distant, it reaches an incredible 70 billion kilometers (44 billion miles) from the Sun—and it takes well over 4,000 years to circle the Sun once. It’s not exactly clear yet, but it’s likely that VP113 is a member of the Oort cloud, a huge collection of gigantic frozen ice balls that orbit the Sun way, way past Neptune. Sedna is the only other object known in that part of the remote solar system, and it gets closer to the Sun by a smidge than VP113 ever does. The closest point an object can get to the Sun is called perihelion, and VP113 has the largest perihelion distance of any object known. The existence of these two objects implies there could be hundreds more. Not only that, but their orbits hint at the possibility of another even larger object out there; perhaps even something as big as Earth! That’s speculative, to be clear, but very interesting. Let’s see how this all works. The Sun is at the center of the solar system. Orbiting it are the smaller, rocky planets (Mercury, Venus, Earth, and Mars), then a belt of asteroids, then the giant planets (Jupiter, Saturn, Uranus, and Neptune). Pluto was once considered a planet on its own, but whether to include it or not is more of a problem of semantic definition than physics. But either way it’s not alone. Outside the orbit of Neptune is a large population of icy bodies called the Kuiper Belt objects (or KBOs if you want to sound cool). These have orbits that can be as close to the Sun as Neptune (about 30 times the Earth/Sun distance) and as far out as about 50 times the Earth/Sun distance. After that, there appears to be a “desert” of KBOs; for reasons still being worked out they don’t seem to orbit any farther out than that. But there are things out there farther yet, in the distant frozen depths of the solar system. Even though they are too far away to see directly, their presence is revealed by, of all things, comets. 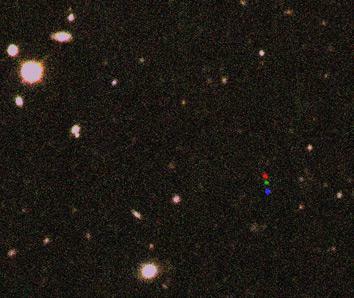 Actual images of 2012 VP113, showing it moving slowly among the background stars. Click to embiggen. Comets are much like asteroids, but have long, elliptical orbits, and contain lots of ice that turns into a gas when they get near the Sun. We see several coming from the far outer reaches of the solar system every year. In the early 20th century, astronomers wondered on that. Comet orbits aren’t stable over millions of years, which means the ones we see must be relatively new compared with the age of the solar system. Also, they lose a bit of themselves every time they pass the Sun, creating those lovely tails. That means there must be a vast repository of them well beyond Neptune’s orbit, or else the solar system would have run out of comets billions of years ago. We call this the Oort cloud, after the astronomer who worked out the properties of the cloud. The problem is, even though the objects in it can get big, hundreds or possibly even a few thousand kilometers across, they’re too distant to see. Indirect confirmation of the cloud’s existence came in 1992, when the first KBO was found. For years, astronomers had realized that if the Oort cloud existed, there should also be a somewhat disk-shaped collection of objects between it and Neptune’s orbit. Now we know it’s there, and more than a thousand such KBOs have been seen. That made the existence of the Oort cloud even more likely. 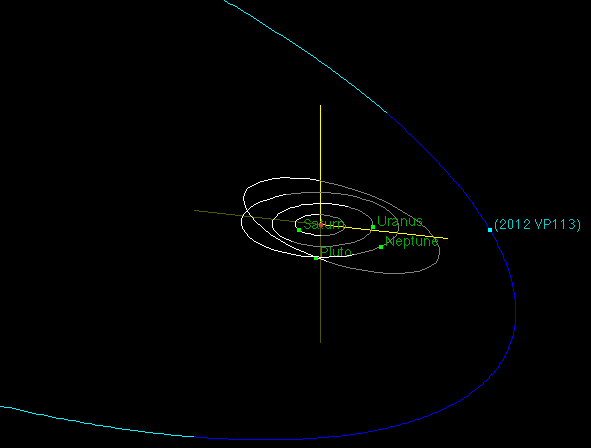 Schematic of the orbit of 2012 VP113. Note that the distance is so big, the scale so large that it cannot even show the inner solar system at all! The inermost orbit shown is that of Saturn, a billion kilometers from Earth. Then, in 2003, astronomer Mike Brown and his team found Sedna, which orbits the Sun even farther out, never getting closer than about 76 AU. It’s on a highly elliptical orbit that takes it out to an incredible distance of about 1,000 AU, or 150 billion kilometers (90 billion miles)! That means it never even gets as close to the Sun as a KBO, and therefore is almost certainly part of the Oort cloud. And now we have VP113 joining it. Let me point out that Sedna actually gets much farther from the Sun than VP113 ever does, but at their closest points VP113 is farther away. Sedna has a perihelion distance of 76 AU, VP113 is about 80. The discovery image of 2012 VP113; its motion makes it appear to be different colors as different filters were used. The discovery of VP113 is welcome news! We don’t know very much about the Oort cloud, except from hypotheses based on physics. We need to actually see some of those icy bodies—Oort Cloud Objects, or OCOs if you like—so that we can observe their behavior. That will in turn tell us a lot about how the solar system works, both now and back when it was young. Why? The inner part of the Kuiper Belt is affected by Neptune. Its gravity can poke and prod at KBOs, altering their orbits. It scatters them, sending them on new orbits. We’ve seen some of these scattered objects (Makemake, for example, and Haumea), though their orbits keep them pretty firmly inside the Kuiper Belt. We might also expect to see objects with more elliptical orbits that take them as close as Neptune when they’re close to the Sun, but reach much farther out at their most distant point. Nothing like that has yet been seen. The orbits of VP113 and Sedna never bring them close enough to Neptune to be affected by it, so it’s very unlikely they’ve ever been a part of the Kuiper Belt. They’re far more likely to be a part of the inner Oort cloud, and that originally formed with the solar system 4.56 billion years ago. We think it’s remained nearly untouched since then, so studying these OCOs is like opening up an eons-old time capsule. They’re a window on when the solar system itself was young. I want to start this part off by noting it’s speculative, so don’t get too excited about it. The orbits of Sedna and VP113 are weird. They are highly elliptical, dipping down into the inner Oort cloud and stretching out to its vast depths. We’d expect their orbits to have started out more circular, so what could have affected them to alter their orbits into the shapes we see today? There are several possibilities. Over the course of billions of years, the Sun sometimes gets relatively near other stars. Right now the closest is Alpha Centauri, 4.3 light years (about 40 trillion kilometers) away. But some do get closer. Can they actually approach us near enough to perturb the Oort cloud? Actually, yes, it’s possible. In the case of VP113 and Sedna, though, it’s unlikely. Though large, their orbits don’t really extend out as far as we think they’d have to to get poked by the passing of a nearby star (which is only close on a galactic scale; it would still be very far from Earth). It’s not impossible, just unlikely. I understand this can be a bit confusing, so let me say a few things. First, VP113 is not the most distant solar system object ever seen; Eris, for example, is nearly 100 AU away. But that’s as far as Eris gets, whereas VP113 gets much farther out. Sedna gets even farther out than VP113, by a huge margin (and in fact is farther away right now). But when you look at all the objects in the solar system, and sort them by how close they get to the Sun, VP113 has the largest perihelion distance. Next, VP113 is not another major planet in our solar system, by any definition of what you might think an actual planet is. It’s probably only about 500 kilometers or so across—far smaller even than Pluto. So no, conspiracy theorists, this has nothing to do with Planet X. We also know of some comets that have orbits that take them farther out than VP113, but those tend to be small (a few kilometers across) and on orbits that aren’t stable over time. Eventually Jupiter’s gravity will profoundly affect them, dropping them into the Sun or flinging them out of the solar system entirely … not to mention (once again) that over time they evaporate. VP113 has a stable orbit, and is likely to have been a member of the Oort cloud for a long, long time. What this does mean is that we’ve (figuratively) shed some light on the (literally) dim outer edges of the solar system. Our telescopic eyes are getting better at seeing these incredibly remote objects; our hardware and software better at teasing out their faint signal. In some ways, this discovery was inevitable! But it’s important nonetheless; we are peering into a region of the solar system that is ancient, but new to us. It’s a window into the past, as well as a peek into an up-to-now invisible population of objects. As we find more of these objects we will learn more about this most-distant part of our solar system. We have an amazing grasp of how it formed, evolved, and became the bustling place we see today. But there is still much to learn, and I can guarantee two things: We will learn more, and we’ll find far more surprises as we do. That’s why this is so much fun.